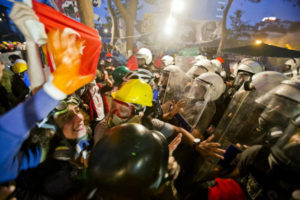 WASHINGTON — Turkish trade union workers on strike and Turkish riot police faced off in the capital city of Ankara this past week, with the Turkish police dispersing the workers with water cannons and other riot dispersal methods. Reuters reports that the police officers stopped the march with megaphones before they headed into the path of the water cannons. No injuries or riots took place, thankfully. But, the protests and unrest throughout Turkey is creating uncertainty. Businesses are uncertain about investment and operation, while the disenchanted youth take to the streets. Prime Minister Tayyip Erdogan has lost his luster in the West and Middle Eastern worlds through his violent crackdown on protesters. His calls for peace were ignored as protesters were pepper sprayed and beaten by riot police. Even when he agreed to meet with the leaders of the protesters, his police still beat the protesters and tried to clear it. These demonstrators sat in protest in the famous Taksim Square in Istanbul to protest plans to demolish and develop it. As the movement grew, more came to join and spoke of how they were upset with how restrictive the Turkish government has been under Erdogan, whose Islamist party AKP has slowly put into place more Islamist policies. One of the most egregious was the ban on alcohol advertisements and a limit on when it could be sold, enraging the secular country. Four people died throughout the 18 days of protests and dozens injured. Now Erdogan is fighting back against the protesters and the movement growing within a disenchanted country. Is Turkey the next country to fall to an Arab Spring-type movement against Islamist forces? That is yet to be seen.